In the past, I have only associated miso paste with making tofu miso soup. However, I have learned that miso paste has greater use than just making soup. Due to its potent salty and savoury taste, it is versatile enough to be used as a marinate as well as to amp up the savouriness in my vegan mac ‘n’ cheese. And here comes another use for miso paste: to make stir fry! 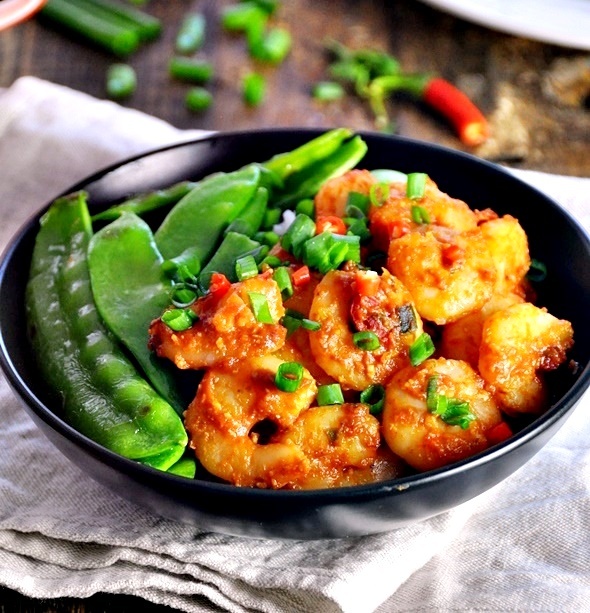 I have came across a shrimp stir fry recipe which requires Tau Pan Cheong, which is a type Chinese stir fry sauce made of fermented soy beans, chili and other seasonings. So I thought since I don’t have Tau Pan Cheong on hand, I could substitute it with miso paste and some fresh chopped chilli and other complementary seasonings. I have also decided to add some tomato paste to soften the savouriness of the miso paste as well as to add some colours to the dish. After all red is a delicious colour, don’t you agree? On thing led to another, this delicious shrimp stir fry was the final product. And shall I add that this dish also required little effort and time to make? In a small bowl, whisk miso paste, tomato paste, a teaspoon of sugar and 4 tablespoons of water until well combined with a fork. Set aside. In a large stir fry pan, add cooking oil. 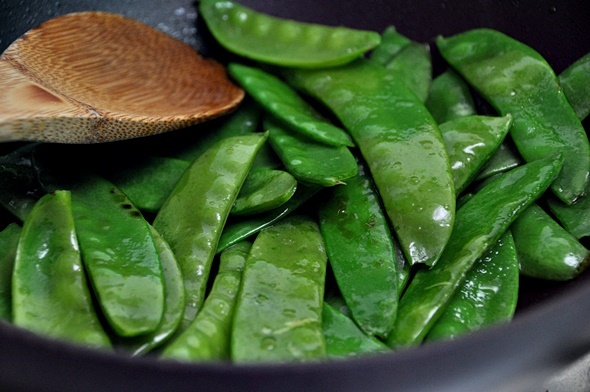 When the oil is hot, add snow peas with a pinch of salt and sugar. Saute until they turned bright green, slightly soft but with a bit of crunch. Transfer to a plate and keep warm. In the same pan, add ¾ of the chopped chili (leave some for garnish later) and the WHITE SECTION of the sliced spring onions (leave the green part for garnish later). Add more cooking oil if necessary. 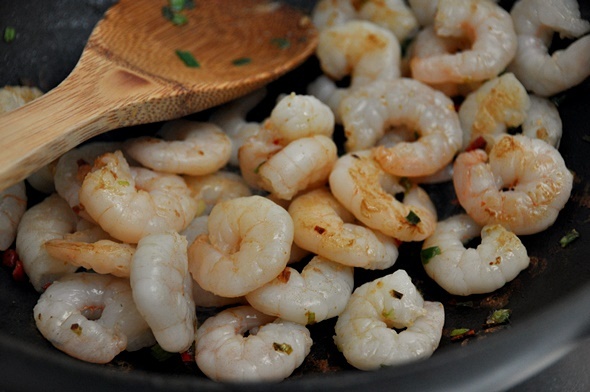 When the chili and spring onion becomes aromatic, add shrimps and white pepper.Saute until they just turned opaque. 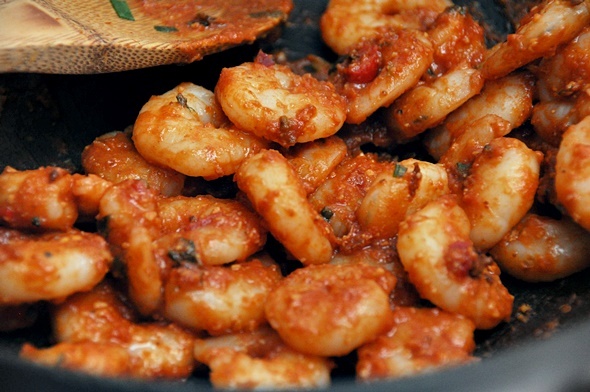 Add the miso-tomato mixture to the shrimps and cook until the sauce is heated through. Check for seasonings and add soy sauce and/or sugar if needed. Add a couple of drops of sesame oil before removing the stir fry from the heat. 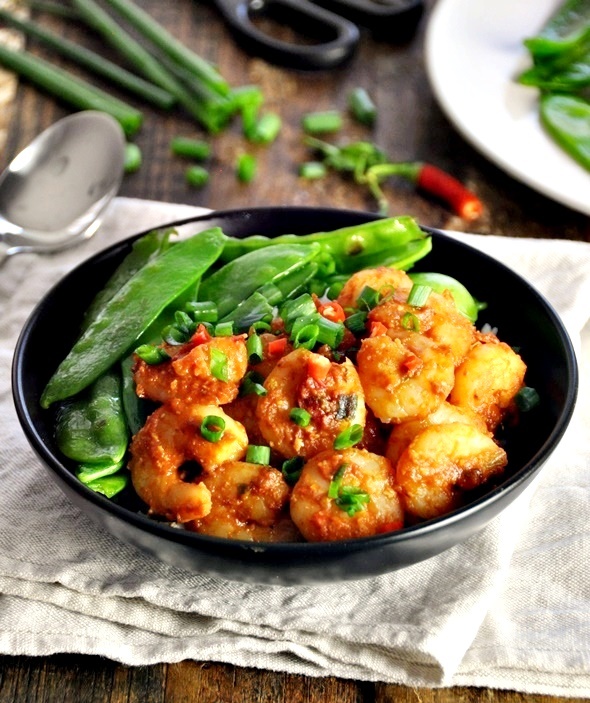 Serve immediately with the remaining chopped chili and spring onions.